When I first came to Japan one of the first things I noticed was that just about everyone had a phone strap/charm hanging off the ends of their cell phones. Some of these were quite big and laughable. Yes, the need to conform was so strong that even I had one on my phone too. I'm guessing since the iPhone, this "trend" has thankfully mostly faded away because there is nowhere to actually hang one off it, and contrary to what most outsiders might think, the iPhone IS incredibly popular in Japan. In my opinion, Japanese phones are quite ordinary in comparison. Maybe five or so years ago, a Japanese keitei was better, but since "western" smartphones came to being, the rest of the world caught up. Macdonalds are doing a food strap promotion at the moment. From what I've just said, I find it amusing there's an iPhone in their promotional photos. There's six to collect. You can either buy a set of them for 3,980 yen *yikes* , or you can buy a large happy meal and get a random choice for "free". I say "random" meaning no choice at all, because they are in a sealed opaque packet that they just hand you. I made a video just for you to show you an unwrapping. After little over a week of posting my video, I've already got 130 views! I guess it helps writing the tags in Japanese. Ha. So, the "cheapest" way to get hold of these is to get a cheeseburger large meal, which depends where you get it from, it'll be 550-600 yen. So, this is my new "pursuit" in Japan. Show me the carrot and I'll chase it. First I got the fillet o' fish burger strap, followed in the same day (yes two, "not so happy" meals), by the fries one. Since making the video, I've also got the Big Mac and the Coffee cup. Now all I need is the quarter pounder and apple pie straps to complete my set! Since I've been in Japan, I'm probably drinking more often than when I arrived, or else it seems like that. For quite a while now I've had most Saturday nights on alcohol-fueled highs. Station beers haven't been as satisfying as they were in the past, but I think my Saturdays are definitely making up for that. The alcohol companies seem to try to up the stakes in their alcohol content. This is one that I had on a station beer night. It proudly states 9%, but I think it's just a clever marketing strategy to coerce you into buying it. My cheap and nasty Daiei chu-hu is 6%, but it's made me feel much more light-headed than this one. On this particular night, we had an old Japanese women come up to us saying, "Give me money!" We just looked at each other in disbelief. Ah, you Japanese. Always the jokers. While a little bored on this particular night, I thought I'd make a quick time-lapse video from my iPhone. There's no sound and it was shot in portrait, so just a little something to show you life, or lack there-of on a typical Wednesday evening. If you want to see a much cooler Yokohama video, check this time-lapse out. I ♥ Yokohama. This was the first night of this mid-summer festival that runs from the 13th-16th. I went there straight after work. There are food stalls lining the walls of lanterns. Great timing on this shot. This was probably the first night of summer that I started seeing the yukata that you see a lot of women wear at this time of year. Was the gaijin taking a photo of the stall or the girls? 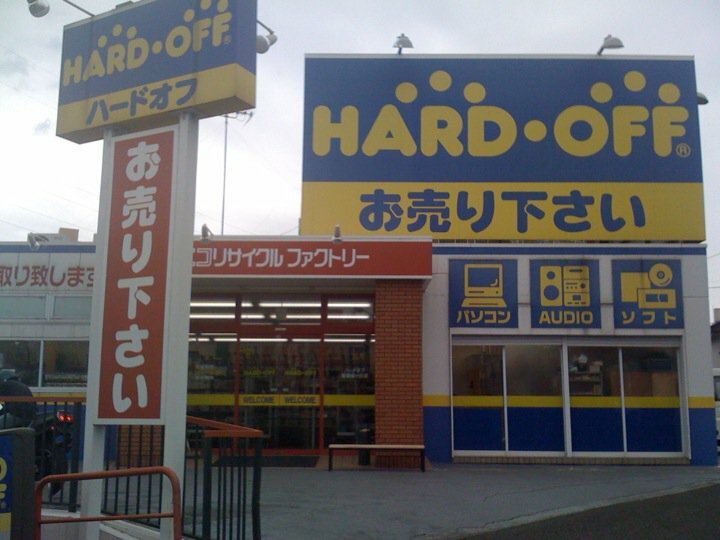 It's been a while since I've mentioned my favourite recycle shop chain, Hard Off. Even after all these years, that name still puts a smile on my face. For some reason I decided to grace them with my presence in Nagayama. I REALLY wish they had these shops in convenient places (like Central Tokyo perhaps? ), and less than thirty minutes walk from a close train station. Maybe it's a blessing in disguise though. If they were more accessible to get to, I'd probably have a hard time (pun intended) finding any bargains at all. 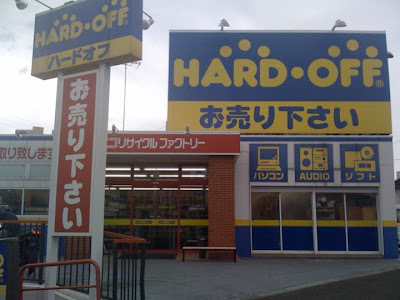 Although it's not the worst of the Hard Offs, there weren't as many bargains as I'd liked to have found. Still, it was interesting to see an old Yamaha V50 synth that I used to have, and old relics like effects units that all the 80s FOH guys had in their live rigs back in the day. Even saw an old Portasound keyboard that we had as kids. Oh, nostalgia! I saw a very old Wacom Artpad that was only 525 yen, but I don't think it was even USB. Not that I needed it now anyhow. After all the slogging to get there I only got some bridge pins for my acoustic. For 189 yen, it was cheaper than in Shinjuku. I had 188 yen in loose change, but the checkout guy insisted I use the 500 yen coin instead of being the good guy, and waiving the measly 1 yen [insert frustrated Japanese confrontation moment] *sigh* I pity the next Japanese checkout person when I give them the correct change in a whole lot of 1 yen coins. After work in Shinjuku I found myself in Taito Station. A "reformed" UFO catcher addict had no good sense to be in a place like this, and as such I relapsed once again and played for a cute motorised dog. It took 700 yen. I'm happy to get it, but I was a little perturbed when the guys after me got theirs in just two tries. It had been raining a lot today. All my shoes (except the docs) have turned leaky. Yes, even those f**** ones I bought not THAT long ago from Fareg (Never again). I bit the bullet, and bought some Rockport Onboard shoes that cost considerably more than my "cheapies". Hopefully they will last a whole lot longer than the others. I got my new best friend, "One One" ('wan wan', geddit?) to model them for you. Saturdays have been my night for hitting the Long Is Iced Teas for quite some time now, and for the most part it's been great to be out socialising and letting my hair down after a week's hard work. On this occasion the guys piked on me, so I was left to my own devices tonight. On the way to Funabashi I'm always keen to look out the train window to check the progress of the Tokyo Sky Tree. For Tokyo, I think it's the most exciting development for quite some time, and by the look of all the people taking photos already even at this stage, I think a lot of Japanese think so too! Ishibashi are having a 10% used sale this weekend, so finally I'm getting a kick drum pedal in Shibuya tonight as well. Seeing that it's "on the way", I decided to get off at Kinshicho. This is what it looks like from the station platform. It took about fifteen minutes for the easy beeline walk to the tower. As you can see from this photo, they've hit the 398m mark. To give some comparison, Tokyo Tower is 332.5m high, so it's already surpassed that height by quite a bit already. From a distance and up close this tower looks impressive on first sight, but after a short while I was there, the proportions looked a little strange as it moves up from a triangulated shape to a circular one. Even though Tokyo Tower clearly ripped off the Eiffel Tower, I think it's presence is more commanding that this one is. Time will tell of course. Once it reaches it's final 634m height I'm sure I'll eat my words. I just hope I'm still here to get the chance to see it's completion sometime in 2012. I spent quite a bit of time taking WAY too many photos and getting lost trying to find the entrance to Oshiage station which is a lot closer (Narihirabashi station is a very close station too), than walking back to Kinshicho, and conveniently able to get me to Shibuya. I didn't want to miss happy hour, so I quickly picked up my Tama Cobra kick pedal for a nice 5,382 yen, and went straight to get my two drinks before it was over. The pedal was heavier than I expected, and a bit of a burden to carry around but not as annoying as the bar staff not giving me the 5% discount using my membership card. I was preoccupied with my bags to notice and they hadn't given me the usual receipt to fight my case. I shrugged my shoulders and thought at least I saved a few bucks with happy hour anyway. I got a seat. It had the potential to be a good night until I heard that night-crushing line. Not long ago I tried graphics tablets in Bic Camera, and although I don't consider myself an artist per se, I had thought in the past to get a graphics tablet. Yahoo Auctions had a few Wacom tablets, and even some screens that you can draw directly on, that would definitely be cool to have. On train beers night I even placed a bid on one that I thought wasn't too badly priced. Seems like they're quite in demand and the price rose quickly towards the end of the auction so no surprises, I lucked out. That night I found a secondhand A4 Wacom tablet online for 12,800 yen which was about as much as the bottom-of-the-line, small size one goes for new, so I made it my mission to go there first thing, assuming I wouldn't drink too much the previous night. If you're hunting for used computer gear, Sofmap and Janpara are places in Akihabara that are definitely worth checking out. In this case, Janpara were the guys that had what I was looking for, so I arrived there not too long after they opened shop and after a bit of interesting communication, I managed to find it in quite good condition, still in the box, only missing the mouse. I managed to knock off 800 yen, so I think I got a good deal. Tablets take a bit of getting used to. My first efforts were pretty lame, but after a bit of practice I'm getting better at it, I think. I bought it for a bit of fun, and to help with editing photos and for that, I think it will serve it's purpose well.